My son was recently in a hockey tournament in a town near Philadelphia, PA. In this picture it looks like he is going to fall. 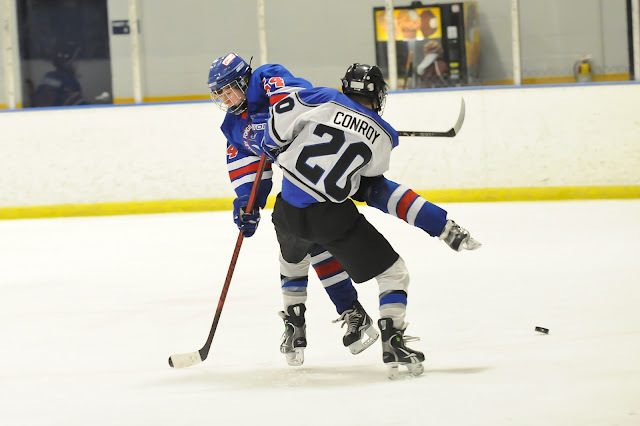 Actually #20 fell over and my son landed on his feet. This is called a 'hip check'. 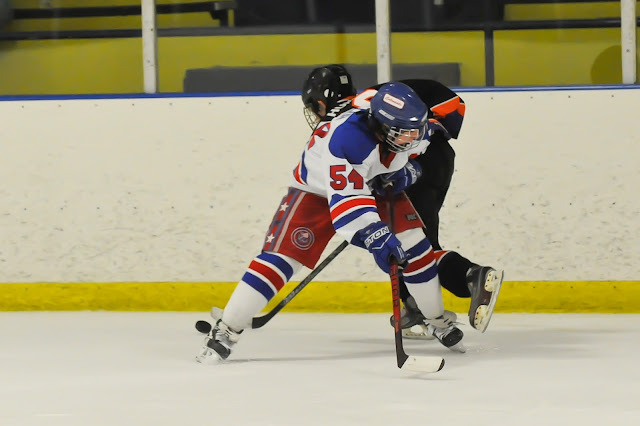 Perfect example (Mommy's bragging rights) of my son checking an opposing player into the boards and prevent the puck being advanced in the offensive zone. Great hockey shots! The games must be more fun watching your son playing. WONDERFUL photos of all the action. Is you son hoping to continue his hockey career as a professional, somewhere down the road? B wants to play when he goes to college. You never know what will happen after that. Cool! What a proud moment! After all these years of watching hockey with hubs, I am still learning the hockey lingo! Flyers, huh? That's where the Canes' former coach, Laviolette, is now, right? Yep, Laviolette is coaching the Flyers. Brindamour was traded to the Hurricanes awhile ago. He is probably retired by now but it was a sad day in Philly to see him go. good action shots. I can even see the puck in both of them. Seeing the puck was the problem I had when I watched a live game. As a Canadian, I will confirm the textbookness of that hip check. Well done! It looks almost like they're dancing, not attacking each other. I really like these shots. Is a hip check anything like a hip chick? Great actions shots! I check my hips sometimes, but I guess it's not the same at all.